TopCashBack.com and Walmart are at it again! Sign up for TopCashBack.com for the first time, click through to Walmart and order a jumbo pack of Pampers Baby Dry for $8.97. 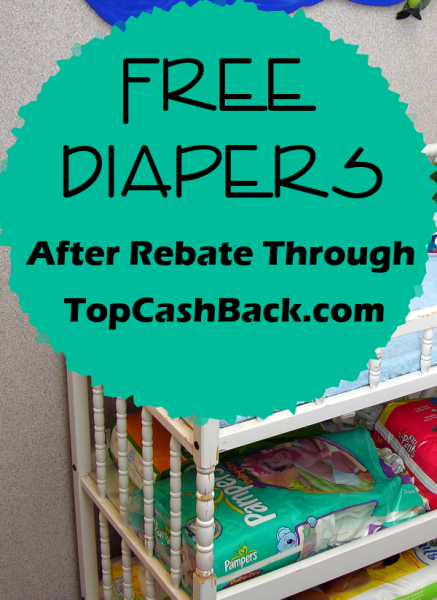 You’ll get back $9.90 in your TopCashBack account – enough to cover the diapers and tax! Remember that you must be a new TopCashBack customer and you MUST order only the diapers – nothing else – after clicking through to Walmart.com from TopCashBack.com. This deal is on top of TopCashBack’s current awesome $10 bonus for new members. That means you can join TopCashBack.com as a new member (assuming you don’t already have an account), and add nearly $20 to your account from buying an $8.97 pack of diapers from Walmart.com. Free diapers are always welcome for anyone with a baby – yourself or a friend, relative or family member. Click here to collect this fantastic free diaper deal by joining TopCashBack.com. Don’t forget to order only the diapers priced at $8.97 to make sure you get your cashback and choose in-store pickup. The deal lasts through Monday, October 5, or until stock runs out. If the price changes from $8.97, the deal is over. You must be a completely new TopCashBack.com member, defined as someone who has never made a transaction through TopCashBack.com. You don’t have to be a new Walmart.com customer. Be sure to completely read the terms and conditions on the TopCashBack Walmart deals page to make sure you follow the proper procedure to get your free diapers! Then, make sure you always visit TopCashBack before shopping anywhere online, so you can get money back from your purchase. It’s really that simple – just login to TopCashBack and click on the link of the store where you want to shop. That’s it! I’ve shopped using cashback rebate sites for many years, and I’ve recently switched to TopCashBack because they seem to offer the highest payout.